Presently there are lots of apps and websites out there that offer free talktime to smartphone users to promote their apps. One such app is mCent App. This app basically gives free talktime to its users just for trying out some new apps and using it for a few days. mCent app is very reliable and it offers much more talktime than other free talktime apps in the market. If you guys use it daily and try out some new app inside, you wouldn't have to worry about talktime on your no ever. Personlly, I've got over Rs.200 talktime from this app in just two months time. So what are you waiting for just click on the below link and start using mCent App & enjoy free talktime forever . . . . . Step 1. 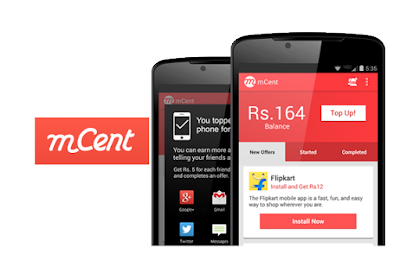 Firstly click on the below link and download mCent app and after installation, sign up with your mobile no. & password. Step 2. Now inside the app download the apps by clicking ''Start this offer'' and try them out and get free talktime. Remember talktime amount varies from app to app like some app gives more than Rs.30 at a time. Keep checking out the mCent app daily to get more free talktime. 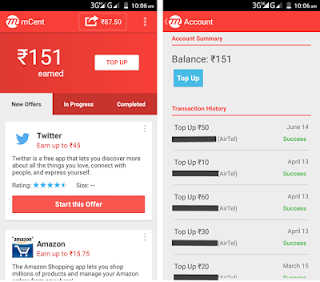 See the below picture showing my current earnings in mCent app. !! So enjoy Free Talktime friends & keep visiting for more such offer in the future ! !